If you're not familiar with these crayfish, you might be thinking two things right now. First, what the heck is a "marmorkrebs"? And second, did you just say "self cloning?" Marmorkrebs is German for "marbled crayfish", which is exactly what these crays are. And yes, they do not need a mate to reproduce! Keep reading for everything you need to know about marmorkrebs and keeping these fascinating crayfish in your own aquarium. Marmorkrebs are closely related to Procambarus fallax. They are not a small crayfish species and although they aren't too fussy about water quality I would recommend an aquarium of at least around 20 gallons (76 L) for a group. Without a filter the aquarium will quickly become dirty, so be sure to only introduce your marmorkrebs in a filtered and fully cycled aquarium. 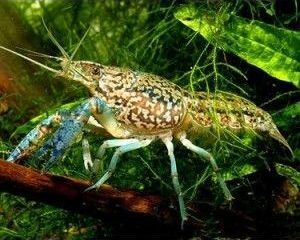 All crayfish love to hide, especially while moulting, and will appreciate plenty of cover in the aquarium. This doesn't have to be complicated: a few pieces of pvc tubing should be enough to keep your marmorkrebs happy. You can also add rocks, fish hides and shrimp tubes to the aquarium. Anything that provides a place to hide when the crayfish are vulnerable during the moulting stage should work just fine. 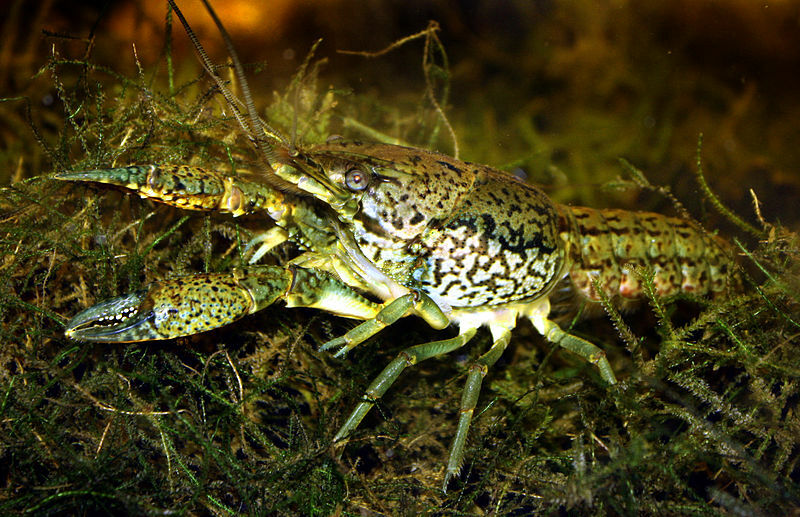 Plants are not much of an option, as these crayfish are omnivores with a taste for fresh greens. They are very destructive and most plants will quickly be devoured! Note: Marmorkrebs are escape artists that can cover great distances outside the water. Keep the water level slightly below the surface and cover any holes in the tank lid as much as possible. As mentioned above, marmorkrebs are not very fussy about water quality. In fact, they can survive and even reproduce in very dirty water, which is one of the reasons they're often feared as an invasive species. In the aquarium I'd still recommend keeping things as clean as possible, because a dirty aquarium is just not a pleasant sight and might quickly start smelling yucky. Specific water values or temperatures are not needed to keep your marmorkrebs happy. Slightly hard water is preferred but not necessary and room temperature should be just fine unless your home gets very hot or cold. Tankmates can be a bit of an issue with marmorkrebs. Unlike their dwarf cousins from the Cambarellus genus they are not always entirely peaceful and I wouldn't recommend keeping them with your shrimp unless you don't mind losing a few here and there. That being said, as far as crayfish go marmorkrebs are definitely not the most aggressive species. Most aquarists prefer keeping their marmorkrebs in a single-species setup. This protects the crayfish babies from larger, hungry fish and also prevents the crays from attacking unlucky tankmates that happen to cross their path. If you do want to combine your marmorkrebs with other species, be sure to go for quick but peaceful fish and avoid anything slow, aggressive or bottom-dwelling. As discussed earlier marmorkrebs are omnivores. They will eat pretty much anything you toss in their tank and might also start nibbling on aquarium plants if not enough food is provided. Feed your marmorkrebs a varied diet to keep them happy and healthy. Algae pellets, tropical fish flakes, blanched veggies, (thawed) frozen foods - anything you can think of probably works! Breeding marmorkrebs is not a difficult task at all. If you're a beginner and would like to get into breeding crays, this might be a good species to start with. Some aquarists might also like to breed marmorkrebs as live food. They make an especially great food for puffer fish, which naturally feed on crustaceans. Honestly, there is not much you need to do to get your marmorkrebs to multiply. You only need one adult crayfish, although more obviously makes for a faster process. Supply plenty of hiding places (the more, the better). Keep the water quality high and feed a varied diet to make sure the crays stay healthy. They should start becoming berried soon. Although most crayfish are known to eat their young, most marmorkrebs breeders report no such thing happening with this species. If you want to be absolutely sure you can separate mother and fry after the eggs hatch. The young don't need separate care and should happily feed on anything they find. Since their discovery in the 1990's, marmorkrebs have become increasingly popular in the aquarium hobby. Although not all pet- and aquarium stores carry them, it shouldn't be too difficult to find one. The Shrimp Farm also sells marmorkrebs (with live arrival guarantee! ), which you can find here.